Grid and storage components are the perfect solution for tools and sporting goods that are difficult to neatly organize. We offer a wide range of custom garage accessories in Riverside,Orange County, San Diego, and Los Angeles including hooks, baskets, and shelves that are capable of holding anything you can imagine to store in your garage. These storage solutions are affordable, attractive, easy to install, and will grow with your storage needs. This grid system is unique because only the grid itself is mounted to the wall. All hooks, baskets and shelves can easily be moved as your storage needs change without leaving ugly holes in your walls, yet all components lock securely into place, eliminating the possibility that they will fall off the wall every time you move a tool. 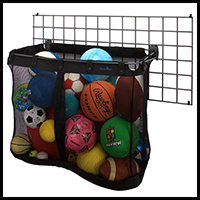 The grid and storage components are constructed of heavy gauge, epoxy coated steel for lasting durability and scratch resistance. Shop Garage Innovations for garage accessories, custom garage cabinets in Riverside, and all your storage needs.